When I heard that a respected Jewish scholar had written a book affirming the ritual murders of Christian children by Jews, I wanted to read it. An e-mail ad I received announced that the Italian printing house Il Mulino was releasing Prof. Ariel Toaff’s new work, Bloody Passover: Jews of Europe and Ritual Homicide (Pasque de Sangue), (1) in early February 2007. Ariel Toaff is a professor at Bar-Ilan University in Israel who made a name for himself for his study of medieval Jewry. (2) He also happens to be the son of Elio Toaff, former chief rabbi of Rome. That such a historian was demonstrating that crucifixions of Catholic children did in fact occur in Ashkenazi Jewish communities in the medieval period was big news. Further, he based his conclusions in good part on the trial records of the famous case of St. Simon of Trent, which he had found worthy of belief. More big news, especially since after Vatican Council II, the Vatican examined the same records, decided they were unreliable, and discontinued the popular cult of St. Simon of Trent. I saved the page, determined to purchase a copy of the book for review after its release. Some months later, when I finally got around to making the purchase, I learned that Bloody Passovers had raised a titanic storm in Jewish and academic circles. The book sold out its 3,000 copies the first week, and then was pulled by the author off the market, never to return. At first, Bar-Ilan University remained calm, summoning Prof. Toaff to ask for explanations regarding his research. But as the pogrom against the Jewish professor swiftly escalated, University heads issued a condemnation against “any attempt to justify the awful blood libels against Jewish people.” Prof. Toaff’s career was on the line. But his resistance didn’t hold out long. Under such strong, widespread coercion, a week after the publication of Bloody Passovers, Toaff published a full apology, stopped distribution of his book, and promised to rewrite problematic parts. To appease the powers that be, he announced that all the profits from its sale would be donated to the Anti-Defamation League. In particular, Toaff looked at the case of St. Simon of Trent, a two-year-old boy from the Italian town of Trent kidnapped by Ashkenazi Jews from his home on the eve of Passover 1475. He was murdered, his body mutilated and crucified head down. The killers were apprehended, confessed and found guilty by Bishop Hinderbach of Trent. Fifty years later, Pope Sixtus IV assembled a commission of six cardinals chaired by the best legal mind of that time for a retrial, and this court also found the murderers guilty. Records of the trial have survived for centuries. St. Simon’s worship was approved in 1588 by Pope Sixtus IV, and every year the town of Trent celebrated his feast with processions and fanfare - until 1965. In that year, to foster better relations with the Jews after Vatican II, Paul VI ordered the Trent case to be re-examined, and ruled that the confessions of the killers were unacceptable because they were obtained under torture. A decree forbade the cult of St. Simon of Trent. His cult was discontinued and prohibited, and the remains of the martyred child removed and hidden to avoid resumption of pilgrimages. What Toaff’s study certainly demonstrates is that the Catholic-Jewish antagonism of the Middle Ages was not a one-sided bias on the part of the Catholics, as it is generally presented today. But any discussion on this topic or the general thesis of Bloody Passovers - that Jews crucified Christian children and used their blood ritually - was summarily closed before it could start. 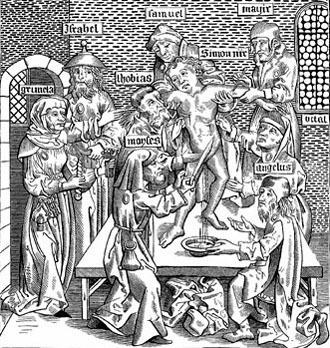 We are simply supposed to dismiss as anti-Semitic ranting any argumentation, even data presented by a serious Jewish scholar, which would uphold that the Catholics could have been justified in their claims that Jews in the Middle Ages practiced blood libel, Kabbalitic black magic, and child crucifixions. In principle, I regard Toaff’s testimony and research as scholarly, honest and authentic. I consider that the enormous psychological pressure he underwent that induced him to take his book out of circulation and apologize is equivalent to physical torture. Anyone with a little experience in law knows that an apology like Toaff’s, made under such violent and universal pressure, is worthless. Therefore, I don’t considerer his apology as a scholarly denial of his long research, and deem the assertions in his book valuable. It is a pity that the book is no longer available. If any of my readers have it and would make a copy and send it to me, I would like to make a very detailed review of his arguments. 1. 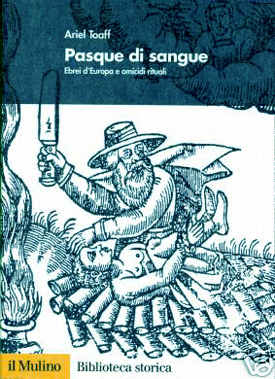 Pasque di sangue, ebrei d’Europa e omicidi rituali (Bologna: Il Mulino, 2007), 325 pp. 2. 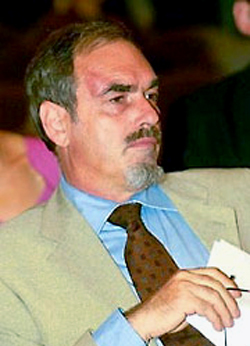 His works include The Jews in Medieval Umbria (1979), and The Jews in Umbria (3 vols., 1993-4), and Love, Work and Death: Jewish Life in Medieval Umbria, (1998). Toaff is the acknowledged master of the social history of Umbrian Jewry. 5. “MKs seek to try Prof. Toaff over claims in blood libel book,” Haaretz.com online, February 27, 2007. 6. “Scholar Pulls Book Revisiting Blood Libel,” op. cit. 10. 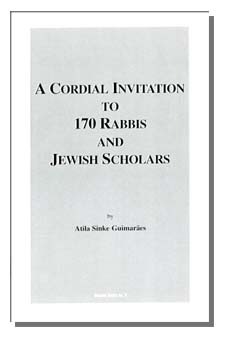 “Scholar Pulls Book Revisiting Blood Libel,” op. cit. 11. Kenneth Stow, “Blood Libel: A Book Full of Sound and Fury,” Storicamente website. 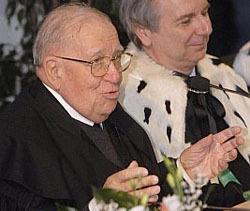 Stow vehemently opposes Toaff’s work, his chief argument being that Toaff trusts too much in the words of Catholic chroniclers and court notaries.